We had an unofficial soup-off here the other night, whereby two soups were made, tasted and judged, and one soup was declared the winner. It was a slurpy, soupy fight. It was a battle of epic proportions. Gauntlets were thrown, tears were shed, friendships were ruined. Vegetables were blanched, fingers were nicked, steam puffed from simmering pots and, in the end, this soup took home the trophy. That’s actually sort of a lie. I mean, we did have a soup-off, and two soups were definitely made and tasted — our friends Dania and Craig made a smooth tomato bisque, Ben and I made cashew cream of asparagus — but as far as judgement goes, we sort of dropped the ball. We just slurped and slurped, each insisting that our own creations were clearly the best, none of us able to keep a straight face while doing so. In the end, no soup was declared the winner, and everyone went home full and happy. Everyone wins? What is that? This is America, dammit, the land of champions, and I demand a trophy. This soup wins! Cashew cream of asparagus! Most original! Sneakiest use of cashews! Maybe not the best looking but all-around tastiest! Best soup in the land! Well. It’s good, anyway. Like, really good. Don’t let the name fool you — there’s no cream in this soup. Just some soaked and pulverized cashews, which add some protein and a full, creamy texture; it really balances out the fresh, springy green of leeks and asparagus. Try it! It’s award-winning, you know. You could easily make this soup vegan by omitting the butter, substituting water for the chicken stock, and using vegan Worchestershire. Place cashews in a large bowl or container and cover with water. Allow to sit for one hour, then drain and set aside. Once asparagus are trimmed of their tough, woody ends, steam them until fork tender and still bright green, about 8 minutes (you may need to steam them in batches). Once finished, dunk the cooked asparagus in a bowl filled with ice water to stop their cooking and preserve their bright color. Drain, chop into smaller pieces (reserve some of the heads for garnish, if you like) and set aside. In a large soup pot, heat the olive oil and butter over medium heat. 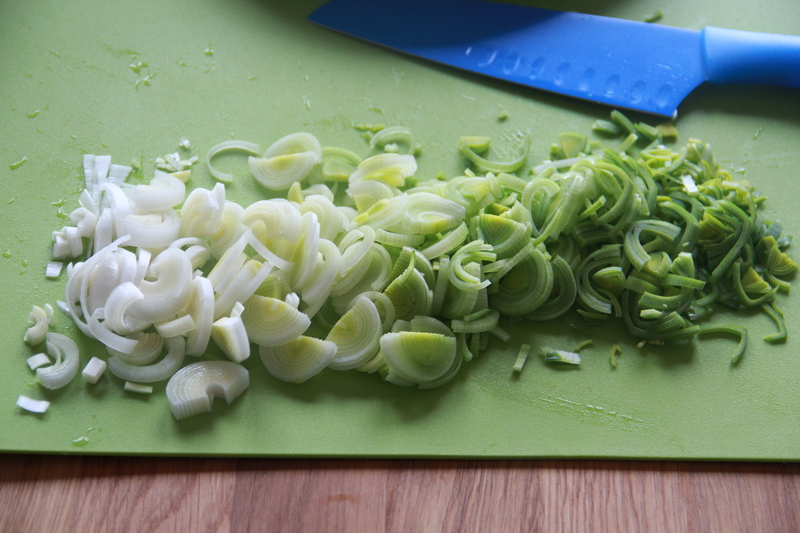 Add onion and leek, and sweat until softened and translucent, about ten minutes. Add garlic, a big pinch of salt and pepper, and cook 1 minute more. Add the reserved asparagus, cashews, and chicken stock to the pot. Using an immersion blender (or working in batches in the food processor), purée soup until creamy and smooth, and place back over a low flame to heat. Add the lemon juice, Worchestershire sauce, oregano, and plenty more salt and pepper, to taste. 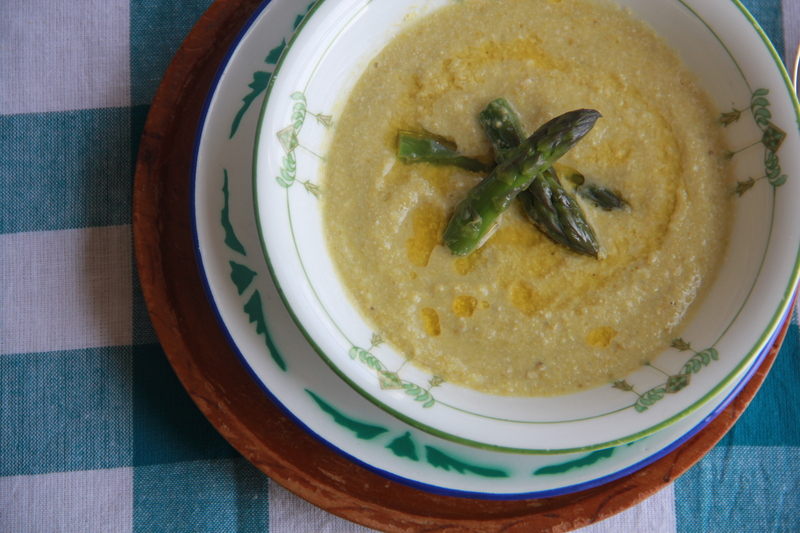 Serve soup warm, garnished with steamed asparagus tops and a hunk of good bread. Makes about 3 quarts (12 cups) soup. This soup sounds delicious! I have been on a soup kick recently and have been making all sorts of soups. Why I haven’t made an asparagus one yet is unknown to me. I love the idea of cashews in it! I might try some almonds since I have a large amount kicking around in the pantry. The bisque was totally the winner! How dare you! Best bisque in all the land! I’m starting a blog…..